tomatillos, water, poblano chiles, onion, heavy cream, lime juice from concentrate, cilantro, garlic, salt, serrano peppers, evaporated cane juice, xanthan gum. - CONTAINS MILK. One bite of enchiladas verdes hooks you forever. Soft corn tortillas rolled around cheese, doused with the luxurious blend of roasted tomatillos, green chiles, garlic and cilantro. Frontera has crafted that beautiful sauce for you from fresh, all-natural ingredients. This product traveled 3539 km to reach our warehouse. In the late 1980’s, Rick and his wife Deann opened the highly-acclaimed Frontera Grill and Topolobampo restaurants in Chicago. In 1987, they authored the now-classic cookbook “Authentic Mexican,” and in 1995, Rick’s cooking gained him the title of National Chef of the Year by the James Beard Foundation and the International Association of Culinary Professionals. 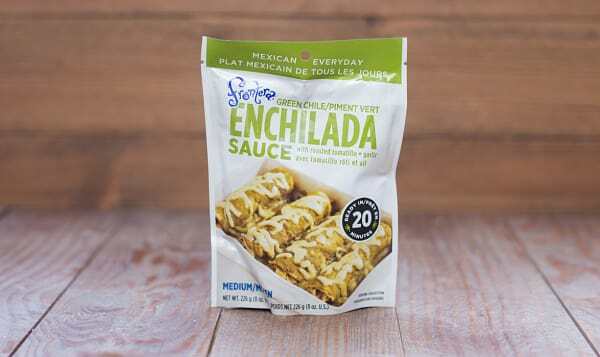 In 1996, Manuel Valdes, formerly a marketing manager at Kraft Foods and consultant with Arthur Andersen & Co. joined Rick to establish Frontera Foods, Inc. to produce and market a line of regional Mexican food products using all natural ingredients and time-honored cooking methods. Partners JeanMarie Brownson and Greg Keller joined the Frontera Foods team as Culinary Director and National Sales Director, respectively.